Centered on the internet site of the firm where firms started advertising their vacancies alongside the information about the firm. Centered on various cyber agencies which were growing in numbers by combining the vacancies upfront from newspapers and outsource HR companies. Such a platform helped in screening the potential and right candidate before sending or forwarding the pool of CVs to the right employer. The best attraction and principle served for the employers was the inexpensive method to attract the potential candidates for a right job. As the results of the survey conducted by Frandland in 2000, the costing of setting up a good website for the firm was equal to the costing of advertising a high profile vacancy in a national newspaper. And the same was true for the high costing figures of printing vacancy brochures on the glossy papers. One of the highest benefits earned by the employers and the candidate was the speed of recruitment process. Candidates were reportedly responding in seconds once the vacancy was live on the internet site or a different link which means that shortlisting procedure will take place much sooner as compared to other methods. Not let’s talk about the drawbacks of the same platform. One of the major distresses was followed by bombardment of CVs of hundreds of applicants applying for a single position. And therefore, software like online screening and shortlisting was conducted in order to receive CVs of only those applicants who are right for the position and thus it will help in reducing the spamming under such a process. But such a screening can be challenging too as they work on screening the CVs on the basis of the keywords included in particular applications. This means that a right candidate can be missed out just because they did not include that particular keyword in their resume. And this is where alternatives like filing an online application form or psychometric test are playing a huge role.Such an approach is beneficial as it helps in screening the candidates who are not prepared to put their time and efforts in filing up the same. But, the coin has the other side too. The process can be unreliable as well because the employer may not know if the application was filled by the candidate or not. One of the huge drawbacks here is that candidates might not be ready to serve their personal information and concerns to the employers through online application form. Talking about the agencies available on cyber and digital platform, the poor standards and unethical criticism has always been an issue. And in order to collect the bank of CVs, they generally generate fictional vacancies which are not really appreciated by the applicants. In fact, one of the major troubles that employers face through such agencies is copied CVs from other sites of the competitive firms which generally degrade the sensitive image of the firm to the applicants. 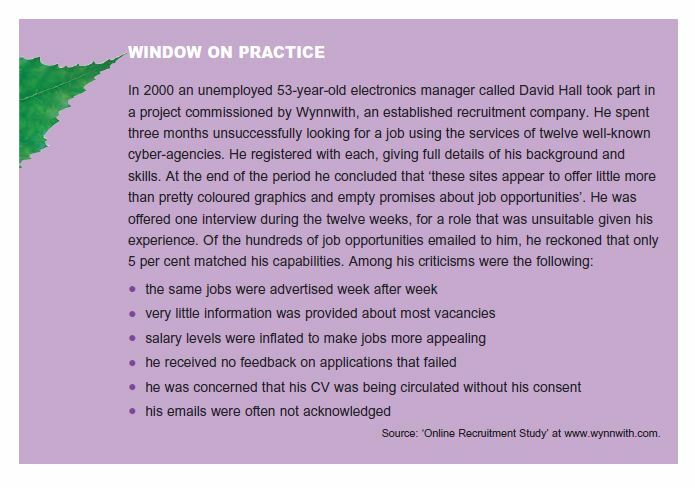 And such a problem is sustained till the time when employers upgrade their standards and generate regulatory regime that helps with better and efficient results in E-recruitment process. And such drawbacks over the benefits of E-recruitment are major reasons in the banking field that major banks do not place the internet platform in the top of their list of recruitment methods. And therefore, for ethical and highly authorized firms, the sustained approach of recruitment will always be awarded to methods like newspaper advertising and liaison of education as highly rated platforms to generate potential leads on job vacancies. But, in a longer period, one cannot deny the fact that digital platform will come up with beneficial and effective improvement in the field of E-recruitment. And such a dream is possible when job sites which are credible and well-funded will take over other cyber agencies from the masses and lead the market with commanding shares in future. And the situation and time will be realized when new job vacancies will be posted on the familiar websites and not advertised on the glossy brochures and national newspapers.